The majority of countries have a national dish. That one dish has the power to tell us an awful lot about each country’s values and attitudes. But, it’s getting harder to distinguish what dishes are native. Why? Because the majority of destinations now offer a multi-cultural choice of foods. Chinese and Indian are top of the list for a surprising majority of Western destinations. Thai food has also been growing in popularity over recent years. While a Thai restaurant would once have been a hard thing to find, there’s now at least one in any major Western city. No one can deny that this variety of food is good for us. We all aim to experience different things, and now we don’t have to travel halfway across the world to do so. But, are these takeaway options an accurate representation of the cuisine in each country? The chances are, a visit to each destination would tell a different story. Let’s look at why. Indian is a top takeaway for a lot of us. Who doesn’t love those exotic spices that pack such a punch? But, anyone who’s visited India for real will tell you that authentic Indian food would be a surprise for your tastebuds. In fact, you could go so far as to say that many of the curries we enjoy have never been seen in the country that’s supposedly their origin. Chicken Tikka Masala, for example, is an English creation which few Indians replicate. The spices we use may be roughly the same, but the tastes created are incredibly different. Our Chinese taste is a little closer to the real thing, but they’re still not exactly accurate. The Chinese are a resourceful people. As such, they eat a lot of stuff we would never dream of. We’ve all seen Chinese food markets on television. Foods on offer include tuna eyeballs and scorpions to name a few. You don’t find them on a standard Chinese menu, do you? As a newer addition to the takeaway tastes, Thai food is the closest you’ll get to the real deal. But, even that has some variations to suit our sensitive palates. The main difference is that our Thai takeaways come in neat foil containers. In Thailand, though, the majority of food is served in food markets. Large batches are cooked up and placed on display. The experience is a much more inclusive one than our private experiences at home. So you see, eating exotic takeaway is far from the real taste of a country. Don’t think you’ve experienced the cuisine of a place because you’ve eaten a home-produced variation. 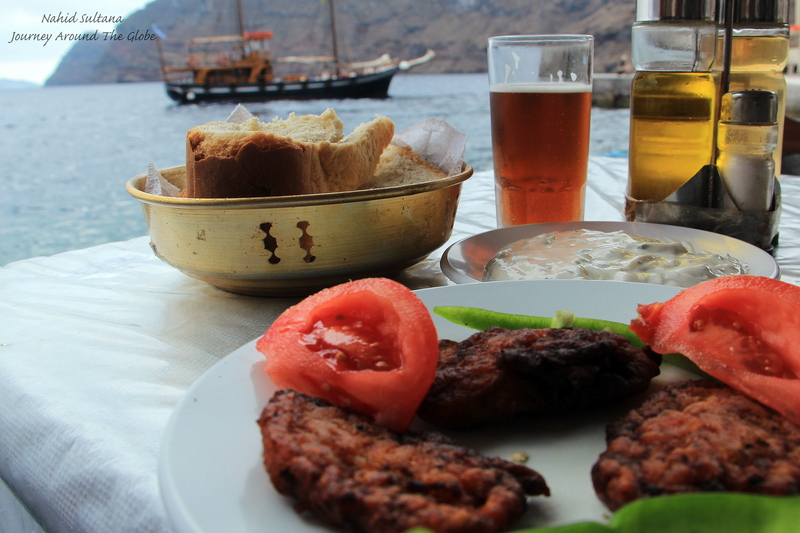 Nothing beats jetting off and experiencing the cuisine of a country first-hand. You’ll learn a lot about the values of the nation as a whole that way. Plus, you’ll find yourself living life like the locals. If you want to know what matters in a country, there’s no better way than taking a taste of what’s on offer there. More people have problems with shyness than you’d think. They’re afraid of making a fool of themselves, of going up to new people and interacting, of making themselves noticed. One of the reasons that travel be great at combating shyness is that it often puts you in positions where you have to stop being shy! The fact is that traveling does often make it necessary for you to come out your shell a little. Not a lot of people can get by in a new place without striking up a brief conversation with a local when they need some help. If you’re staying in a hostel or a small bed and breakfast in order to save some money, then not interacting with other people just makes everything feel more awkward. Depression, like shyness, affects a surprisingly large number of people. While there’s no such thing as a simple cure for a depressive disorder – even pills and counseling can only go so far for most people! – there are loads of ways in which you can lift your spirits in the long-term. Exercising, eating right, being creative – and traveling. Travel helps you combat depression because it gives you a sense of actually doing something – and a lot of people who struggle with depression often feel that they’re stuck in a rut, not doing anything particularly interesting. Going somewhere new, experiencing different weather, meeting new people – it all helps you feel better. At the very least, it will help distract you! There are a lot of words you could use to describe the world right now. Confusing. Strange. Absurd. Many would probably choose the word ‘scary’ above all others. Sure, the world has always been a scary place – but there’s something distinctly grotesque about the world right now, surely? Traveling helps you put those worries to bed. Yes, there are horrible and baffling things going on all over the world. Maybe that puts you in a bit of a funk sometimes. Maybe it prevents you from even wanting to travel for fears of your own safety. But trust me – when you visit more places and see a lot more of other people’s everyday lives, you’ll start to fear the world a little less. It’s no Disney movie, but it’s no horror show, either. One of the most common phobias in the world is that of flying. (And, to be honest, part of me still feels that you have to be just a little bit insane not to be a tiny bit scared of being in a metal can tens of thousands of feet in the air going at hundreds of miles per hour.) While it would be a lie to say that traveling more often will definitely make you fear it less, it certainly helps for most people. I’m not talking about the fear of being alone in the long term. I’m referring to people’s often-irrational desire to not be in their own company. It can stem from a lack of confidence, or too big a reliance on others. To some, traveling alone would seem to be the worst possible thing you could do in this situation. But it may actually be the best. Traveling alone can help you overcome the worries of, well, being alone. It boosts your confidence – everything I mentioned in the ‘shyness’ section goes double when you’re by yourself! It also helps you get a stronger sense of yourself. By taking a solo holiday, you may surprise yourself by how un-lonely you end up feeling when there’s so much around you to discover. It may help you rethink ‘being alone’ when you’re back at home. Even when people go away for a relatively short time, they often feel a little homesick quite quickly. It’s often thought of as a mild, nagging sensation that can be easily dismissed – and it probably is that way for most people. But for others, homesickness can be so overwhelming that it dampens the entire trip. The more you travel, the more you learn to get over these feelings. In the meantime, you can do this by ensuring you’re always doing something to distract yourself, even if it’s simply wandering around and taking in the sights. Check out these tips for beating homesickness on the road. 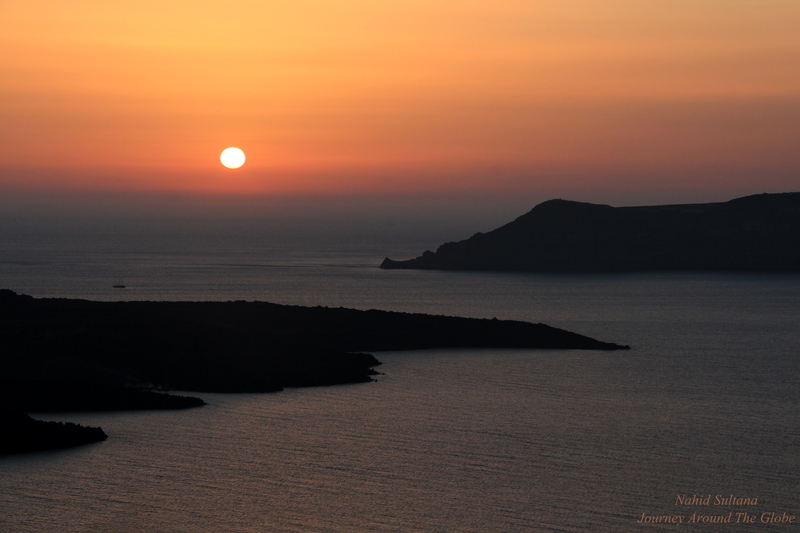 SANTORINI, GREECE: Santorini, official name Thira, was in my bucket list for a long…long time. It’s one of the most beautiful and photogenic islands in the world and a real romantic place for honeymooners. If its stunning geography doesn’t attract you, then many of its naturally fantastic beaches will, or its frightening history of volcanic lava and earthquake will, or its blue and white villages will, or may be its unique sunset will, or the way white-washed buildings look like they are stacked on top of each other on the cliffs will. I can name lots of things about this island that will attract everyone with different interests…but you have to visit to feel. As for me, I loved hopping from one village to the other and be amazed with history. 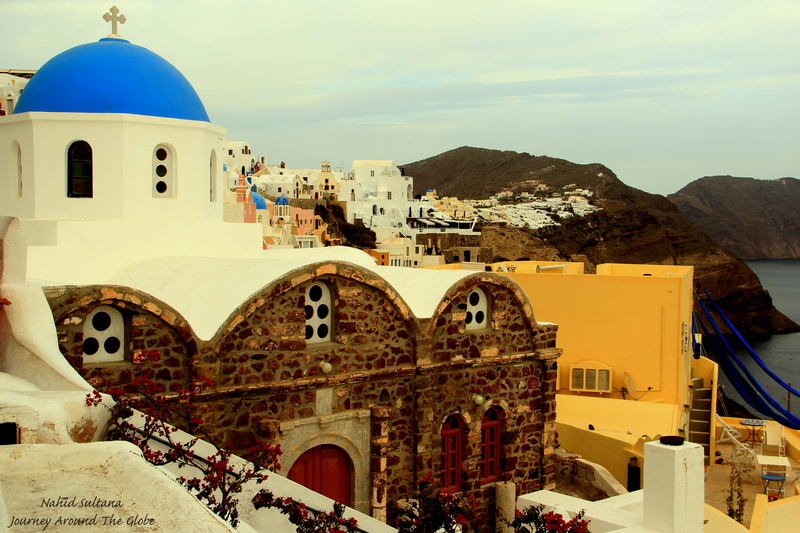 Santorini is a crescent-shaped skinny island. The villages are very spread out depending on where you are going. But do get out of the tourist sections to enjoy true beauty. You will see fun-loving young Greeks, villagers, and fishermen…that’s what I cherish the most from this trip. What makes Santorini different from other islands of the Cyclades is that it was built on thick lava of volcano which rose from the molten core of the earth. But the contrast of the deep blue sea with red, brown, and black colors of the land, the depth and clarity of the horizon sweeps away the nightmarish birth of this island. Overall, it’s wild and imposing natural beauty cannot be found anywhere else. 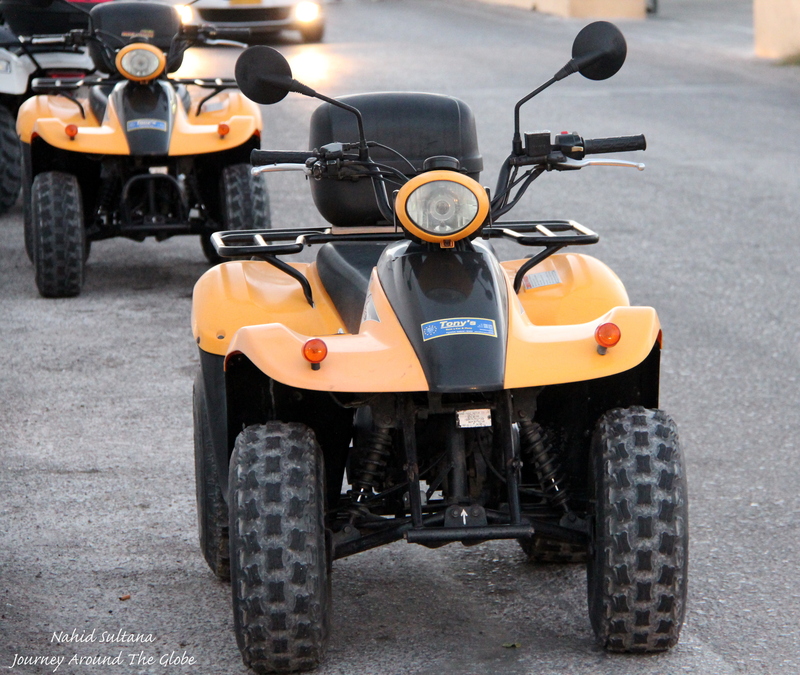 To get around the island, ATV is probably the best way, although I saw many people riding on rented cars. But be careful of crazy drivers and parking can be a problem if you rent cars, especially in Fira or Oia. I mainly rode on public buses to all my sites. But be careful, they look like tourist coach buses and don’t have a STOP button and sometimes don’t stop at all if no people are getting on. I told the ticket master on my 2nd morning that I wanted to get off at Firostefani but he forgot to tell the driver and I ended up in Fira along with another British lady who also wanted to get off at Firostefani. Also it’s a bit inconvenient but every public bus stops at Fira whenever you go to. It costs from 1.60 euros to 2.20 euros depending on where you are going to. 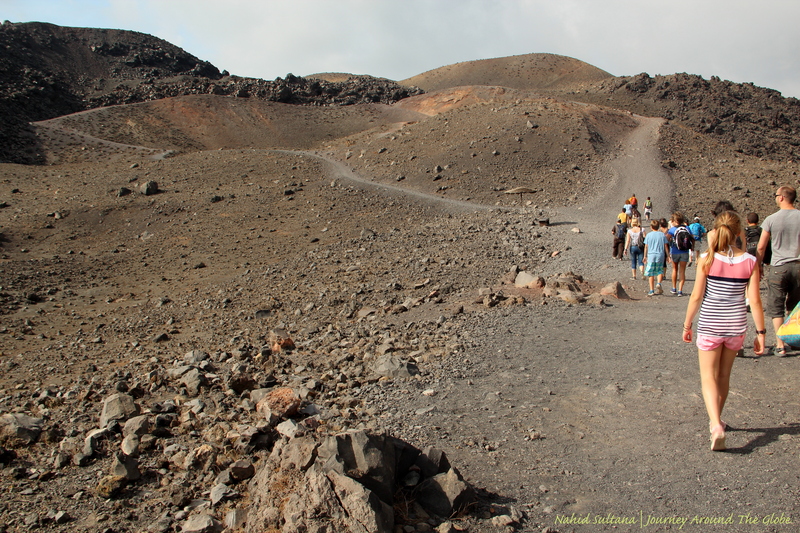 From Oia to Fira there is a hiking trail that you can take to go parallel to the cliffs and the sea. I didn’t dare to take this trip since I knew I am not fit enough for this and I didn’t want to waste time just walking. I wanted to explore different traditional settlements. But to enjoy the island to the fullest, be ready to climb up and down lots of narrow stairs…otherwise you won’t feel the vibe. I booked a boat excursion (see below) 2 days before the trip. It was 30 euros for a 5.30 hours of guided tour (lunch not included) and started at 10am. I was picked up from my hotel around 9:20 and was taken to Ammoudi Bay in a mini-bus. 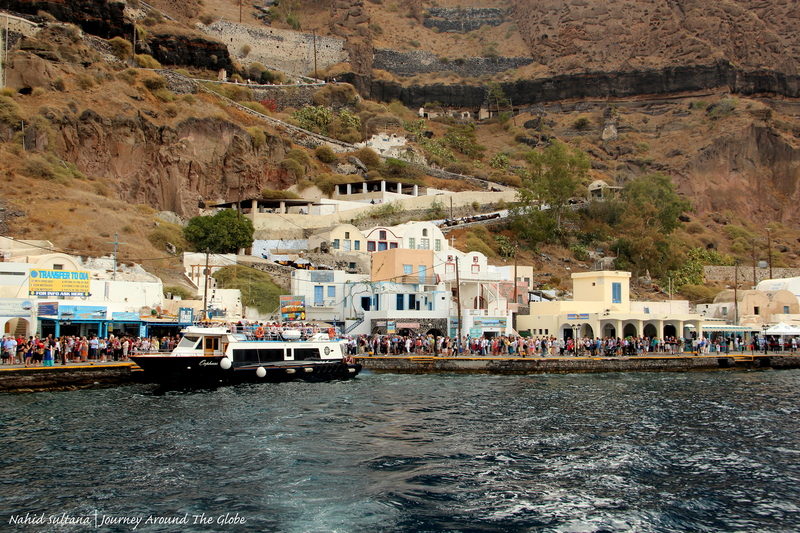 From Ammoudi Bay we were taken to Fira Old Port to pick up more people. Our first destination was to Nea Kameni, then to Palea Kameni, and then Thirassia before dropping us back to Ammoudi Bay. I am glad I took this trip to see the volcanic islands up-close and smell its sulfuric air. This is one trip that shouldn’t be missed to get a different perspective of the island. 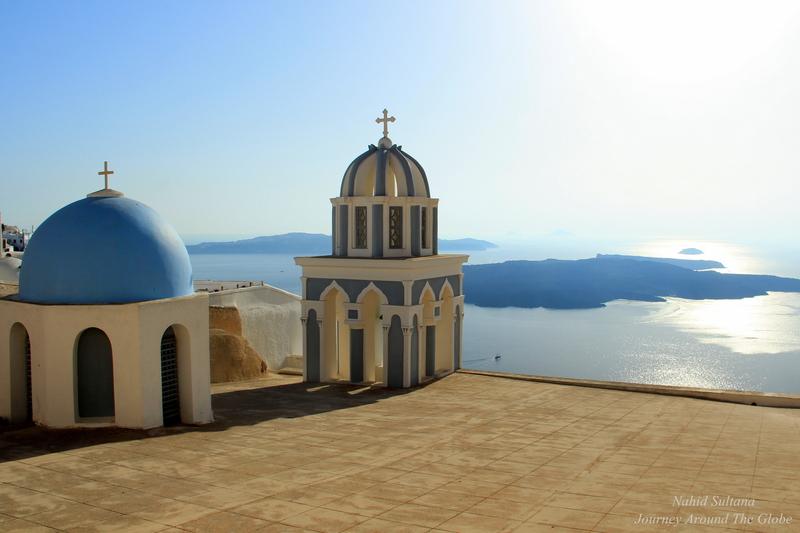 TIME of TRAVEL: It was in mid-October 2013 when I flew to Santorini. The island definitely slows down after October. You won’t see crazy amount of tourists like during summer months. Water was still warm for those who are interested in going to beach and enjoy water. Unfortunately, I got rain on my last evening there, hence, missed a chance of watching sunset over dinner. Other than that the temperature was around early 80s during daytime. But I wouldn’t recommend to go there after October because then many shops and hotels close down for winter and the buses are not that frequent either. 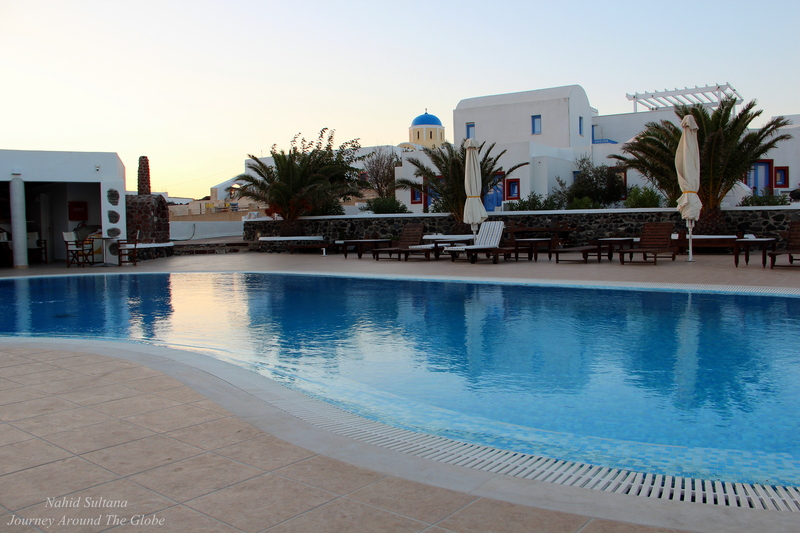 MY HOTEL: I stayed at Laokasti Villas and Restaurant in Oia, Santorini. 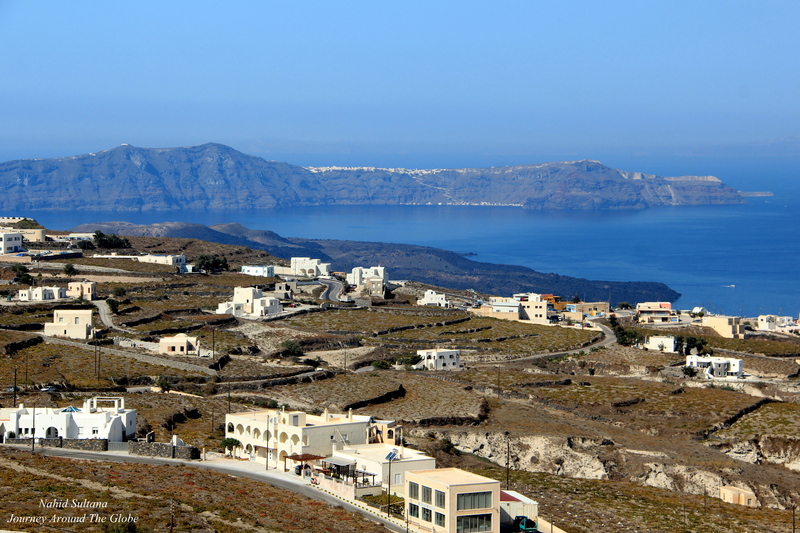 Although Fira is closer to the airport, it is touristier than Oia. 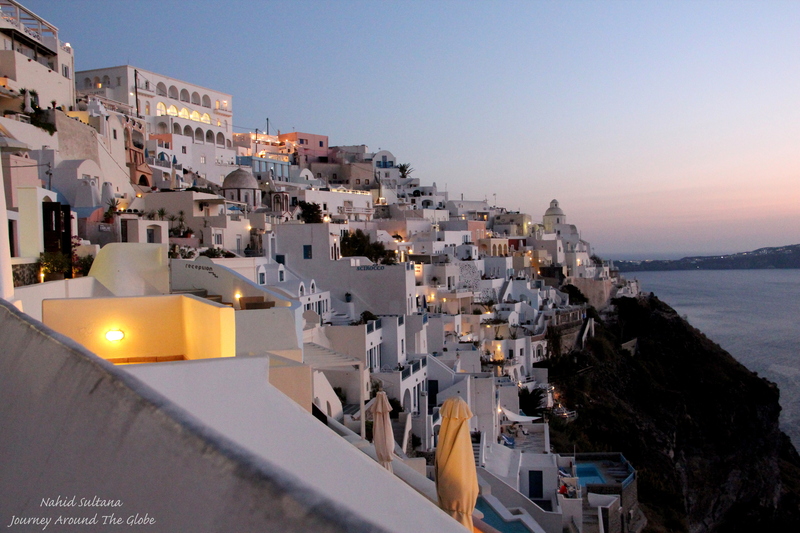 I wanted to stay in Oia, not only because I can see the best sunset only from steps away from my hotel, but also it’s quieter and cozier than Fira. This hotel had free breakfast, although I didn’t wake up a single morning to eat. I decided to catch up on my sleep after spending a whole sleepless night in Athens airport before catching a 5:30am flight to Santorini. It also had free Wi-Fi which was lousy but worked once in a while. The best part was that I had a partial ocean-view room with a little porch. The swimming pool was fantastic also and some of the rooms had the pool view. Also, you can order an in-room massage service here…very cool I thought. I booked my boat tour thru the hotel and also my airport pick-up/drop-off…they were very helpful and efficient every time. I had a small kitchenette in my room with nice clean linens and a small red bathroom. The location was very nice for me because bus stand and Oia pedestrian zone were both right across the street. There were also couple small restaurants and supermarkets near this place…overall, I loved it and I would recommend it to anyone going to Santorini. EATING and SHOPPING: Santorini has plenty of options when it comes to satisfying your taste and hunger. For any meals, snacks, or drinks Fira and Oia probably have more options, but not necessarily the best ones. Most of the villages and all the beaches have restaurants that will offer you view of the caldera, blue sea, and the islands nearby. Do expect higher prices from restaurants with sunset or caldera view…but it’s all worth it. 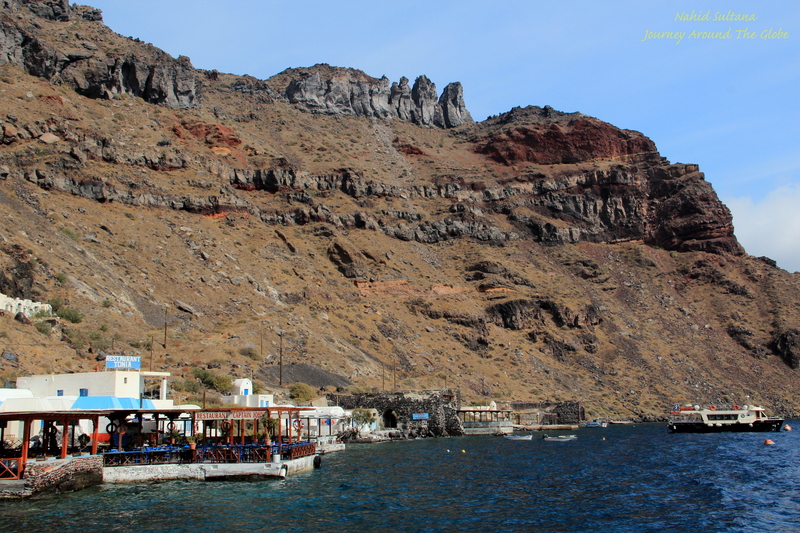 If you are looking for the best sea-food restaurants, go down to Ammoudi Bay from Oia and there you will see many fish taverns. 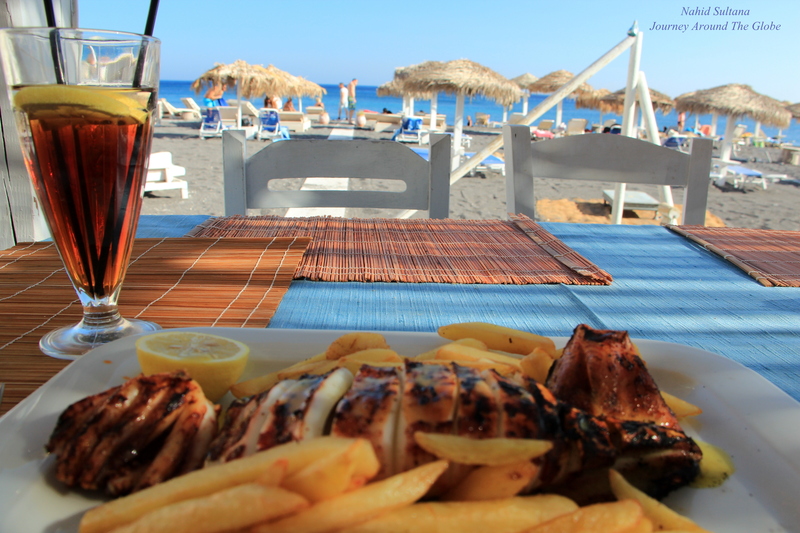 Beaches like Perissa or Kamari also has some great fish places. Tomato balls or croquettes are something unique of Santorini and should be tried even if you don’t like deep-fried stuff. I used to have them almost for all my meal as side…try it with taztziki sauce…yummy. Other than that most of the traditional Greek places have Greek salad, Greek style spaghetti (with capers and feta cheese), pizza, gyros, kebabs, moussaka, souvlaki, Greek omelet with feta cheese, olives, and kataifi…a sweet dessert with honey and nuts. Oh, and don’t forget to try local tomatoes…they are full with flavors, best ones I’ve tried so far. My first lunch was at Demilmar in Perissa Beach. I must say I loved my relaxed meal with a memorable ocean view and its sweet sound. They had traditional Greek dishes like moussaka, souvlaki, fresh seafood, as well as burgers, pizza, and pasta. I had grilled calamari…fantabulous. 2nd day I had my lunch in Fira in a restaurant on the shopping district, can’t really remember the name. Really enjoyed my Greek spaghetti with capers and feta cheese while enjoying the fresh ocean breeze and looking at the volcanic island in front of me. When I went for boat tour, we had lunch in Thirassia. Tomato croquettes with taztziki sauce and bread was awesome while looking at water glimmering as the sun was shining on it. Last dinner I did was in Oia, called Floga, a restaurant that was recommended by my hotel (another recommendation was “Thalami”). 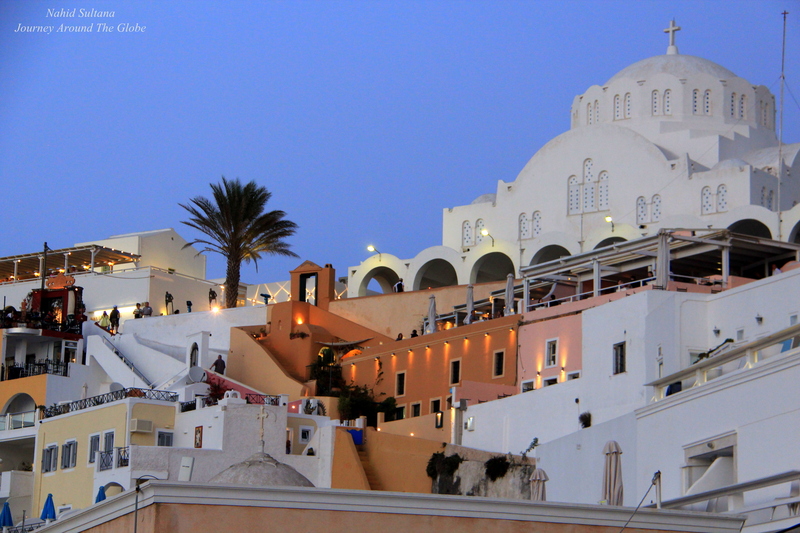 They are both located on the main shopping district of Oia. It was raining badly on my last night of Santorini. Floga usually has a nice view of volcano and offers beautiful sunset view too, but for the rain we were inside the plastic shade and couldn’t see much of the surroundings. I was in the mood for some seafood that night, wish I could go down to Ammoudi Bay for that but the rain didn’t let me. Either way, Floga has some very good dishes along with some traditional Greek cuisine with some pricey tags. 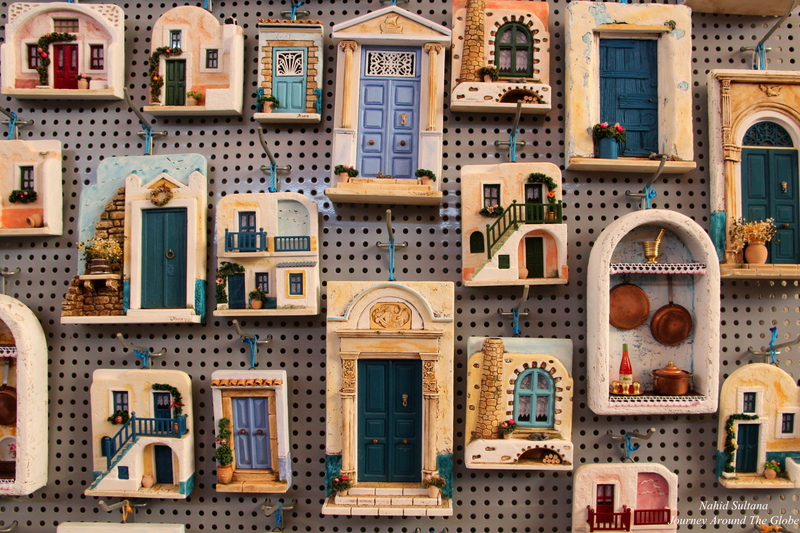 Greek olives (especially Kalamata olives), stuffed donkeys, Greek pottery, olive oil, Greek delights, embroidered laces, decors or jewelry made from lava rocks, miniature Cyclades houses, and Santorini paintings just some of many things the island can offer you to take back from here as gifts or memoirs. If your pocket is really heavy then buying Greek gold can make sense. I got myself a lava rock man for 12 euros, a miniature house, and some jewelries. If I had some room in my luggage I would have put some packaged olives there too. PLACES I’VE VISITED: You don’t really need a walking-map in Santorini. Although the island is not marked very well, half the fun is getting lost in white-washed alleys and climbing up and down the stairs near the cliffs. 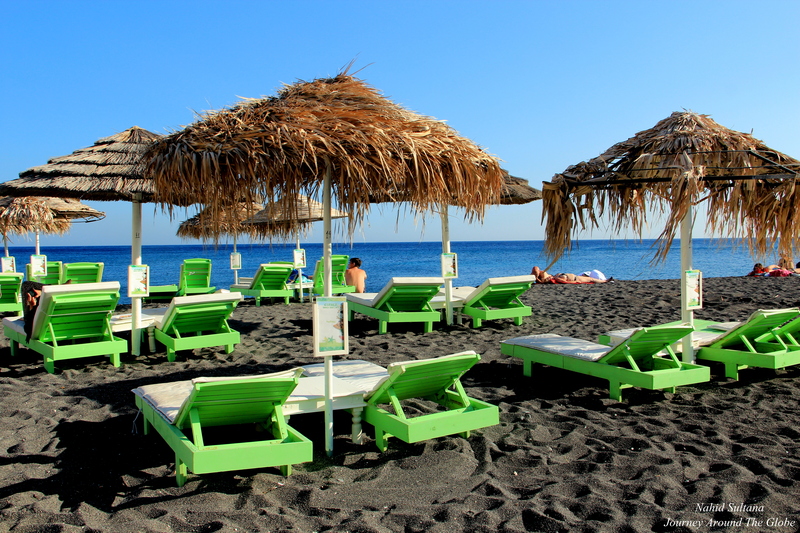 If I had one or two more days, maybe I would have gone to Akrotiri and Ancient Thira– where you can see a stunning collection of ruins from ancient settlements of Santorini, Kamari Beach, Red Beach, Village of Finikia, and Village of Emporio. Finikia and Emporio are, I think, more like Megalochori with traditional buildings and small settlements. 1) MEGALOCHORI: This is the first village I explored on this island and I instantly fell in love with it. About 20 minutes of bus ride from Fira, Megalochori (pronounced as Megalo-hori) is a small but stunning village of Santorini. Walking through the white-washed walls, gazing at Cycladic domed churches, peeking through those traditional blue and white houses, and the listening to the quietness of this typical Greek village made me feel really lucky that I decided to come here first. If you want to have some romantic time on this island, Megalochori has some nice cafes, restaurants, boutique stores, and picture perfect village neighborhoods that will stay in your heart forever. I spent about 45 minutes here just strolling thru the small streets. Just follow the sign “Traditional Settlement” to start your tour after you get off the bus and you will be glad that you visited this place during your stay in Santorini. 2) PERISSA BEACH (BLACK SAND BEACH): From Megalochori, I took a bus to go to Perissa Beach which took about 45 minutes of driving thru barren lands and stretchy zigzag mountains. Look out the windows…you will get a different feeling of the island. I was starving as soon as I got off the bus and had to satisfy my hunger first. After lunch, I spent plenty of time just walking by the beach and going to some nearby shops. 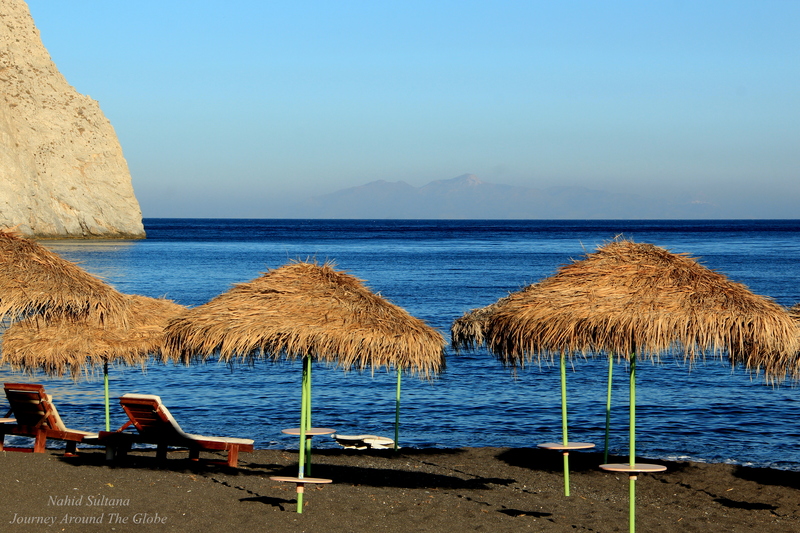 As they say, Perissa is the most scenic and best beach in Santorini, that’s why I picked only this one among many others to spend my late afternoon time. This is the black sandy beach. Few people were swimming and sun-bathing in the perfect weather of October. Good thing it wasn’t that crowded. 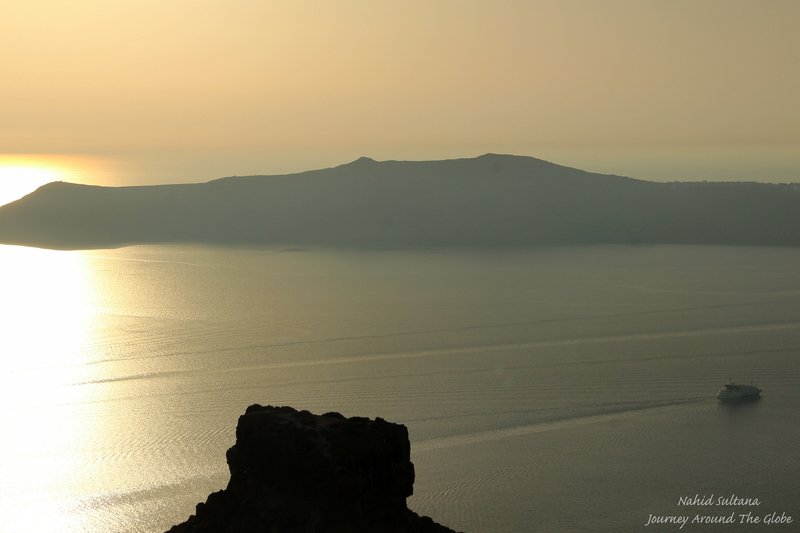 While you are enjoying the weather and the sea, don’t forget to look back at tall, dark, and handsome mountain, Mesa Vuono…the tallest one of Santorini. Overall, this was my ultimate place to relax under the sun and experience a nice islandic scene. Perissa Beach is about an hour on bus if you are coming from Fira. During off-season, like in October, the bus runs only once an hour…so plan accordingly. 3) FIRA: Fira was my last stop of day 1 in Santorini and I ended up coming back to this town few times more in the next 2 days. It’s the capital of Santorini and the touristiest town of it. It is probably livelier than Oia but definitely louder and overcrowded too. 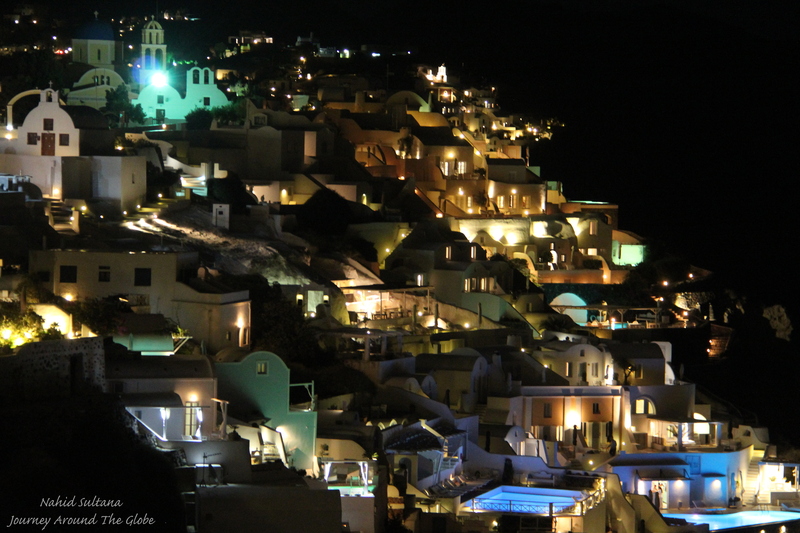 If you are into night life, than Fira has more clubs and bars than any other places in the island. The tourist part of Fira is smaller than you can think. There isn’t a lot to do here other than visiting some museums, churches, and of course enjoying some best cliff-perched town views. Strolling through its shopping district and gazing at overpriced jewelries, clothing, and art studios were fun for me. Walk on small streets, sit down in cafes with view of caldera and volcano islands or just go crazy in those unique shops. One of the best things to do here is watch sunset from any street or over a nice dinner. On the first day I kind of hurried to go near Hotel Atlantis from where you can experience sun going down behind the volcano islands…simply incredible. I took a small street near Hotel Atlantis down the cliff and started walking without really knowing where I will end up at. But this was the best way to get some views of the caldera itself. Here you can walk along the cliff and parallel to the sea to see some colorful stunning hotels and resorts with blue serene swimming pools looking over their big brother – the Aegean Sea. Although I didn’t do it, I saw many people lining up to catch a cable car to go down to Fira Old Port. If you have energy, maybe it’s best to walk some 600 steps or just take an unforgettable donkey ride either way. Walking to Old Port should be half the fun but have to be careful of donkey poo and its smell. There’s nothing much to do there unless enjoying the harbor and taking some pictures from sea-level. It does get really busy when passengers from cruise liners disembark from ships. 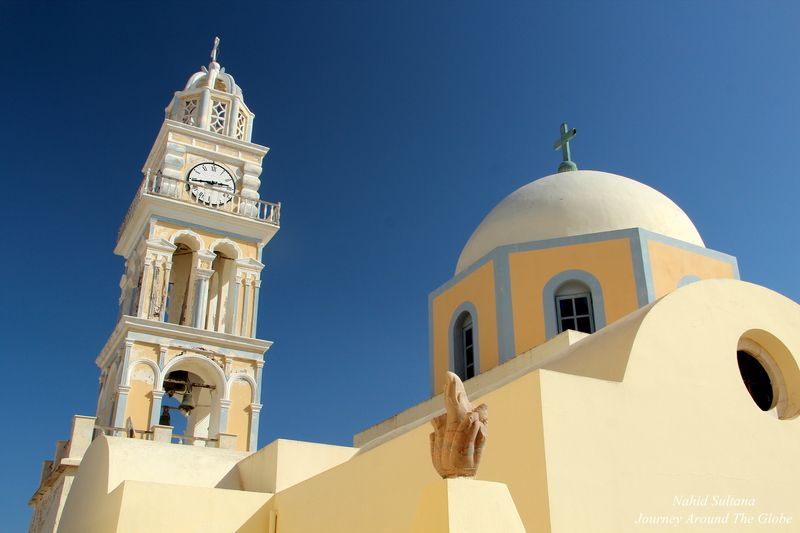 Cathedral Church of Candlemas of the Lord is a small but beautiful church in Fira, right beside Hotel Atlantis. Most of the churches I saw in Santorini were closed, but luckily this was open and I could get a taste of what a Greek church looks like. It has lots of frescoes on the wall, high ceiling, and a decorative altar. It was free to enter but we weren’t allowed to take any photos inside. Another cathedral I visited was Catholic Cathedral of Saint John the Baptist. It was built in 1823 but was damaged by the 1956 earthquake. Then finally, it was open again for worship in 1975. Loved its gorgeous ceiling and alter. It’s small but worth climbing the stairs. Dominican Monastery is only few steps away from this church, but it was closed. It’s free to enter. Fira has the main bus stand and wherever you go you have to go thru Fira. That’s why it may take some extra time when you are planning to go to far away villages and beaches. 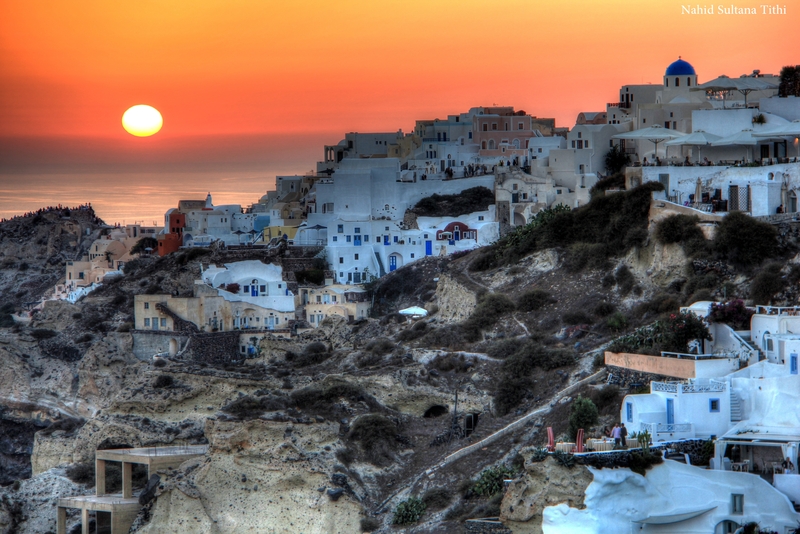 4) OIA: Oia is definitely the most beautiful and vibrant village of Santorini. It’s famous for its reputed world-famous sunset. After it was hit by a hard earthquake in 1956, the village was left barren for many decades. Then slowly started to get back its face, I think, around 1990s. 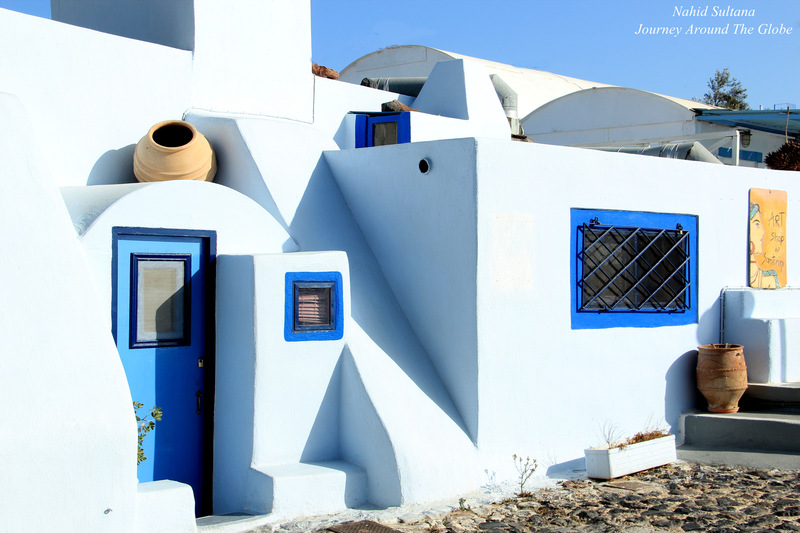 Now Oia is the newest part of the island overlooking the Aegean and attracts more tourists than any other villages here. It has the most beautiful cliff dwellings and luxurious hotels and resorts. 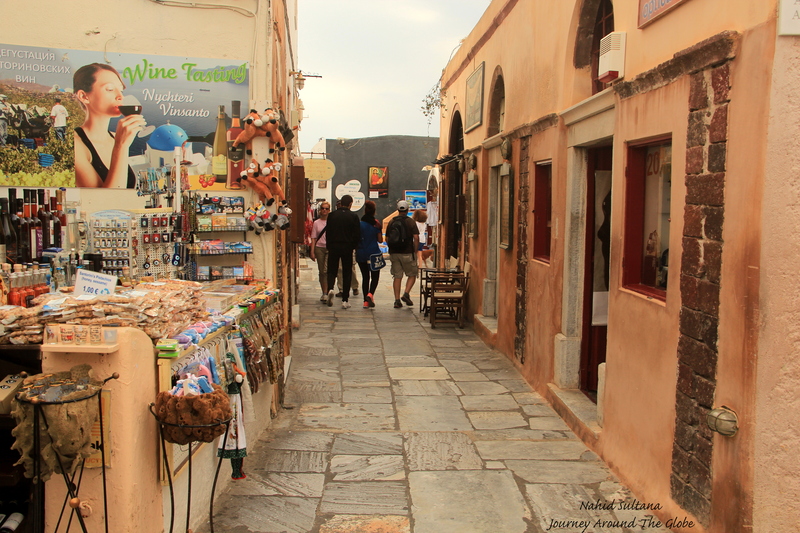 The main pedestrian lane is paved with marble and has lines of art studios, Greek gold jewelry shops, bars, taverns, and souvenir shops. I didn’t go to Oia Castle which is an old Byzantine castle at one end of the village. The best and famous sunset is to be enjoyed from there and you can see every tourist walking that direction right before the sunset to reserve the best spot in the ruins of this castle. During summer/peak season it’s better to be there at least one hour before the sunset so that you don’t have strangers’ heads blocking your view and your viewfinder. I stood at the beginning of pedestrian zone near the church (and right opposite of my hotel) and it was awesome watching the fiery sun slowly hiding under the water. 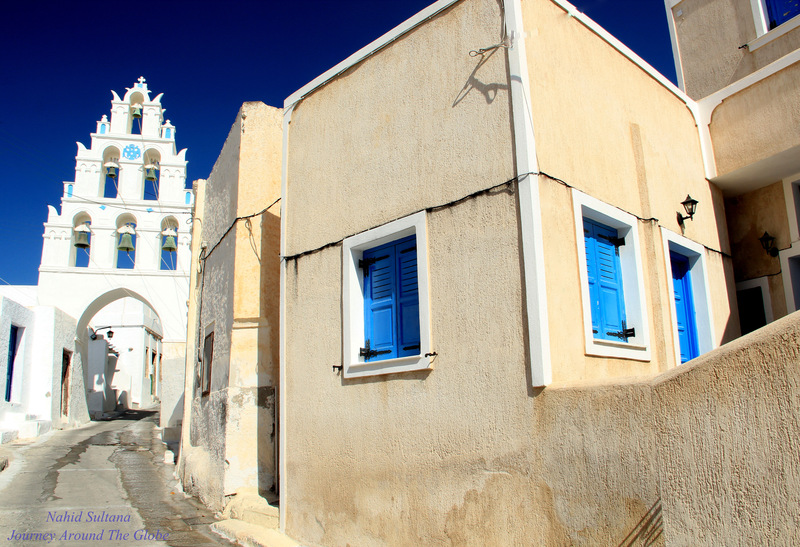 5) PYRGOS: Located on a hill, Pyrgos is the highest point on the island. This is one of the oldest villages here and once was the capital. 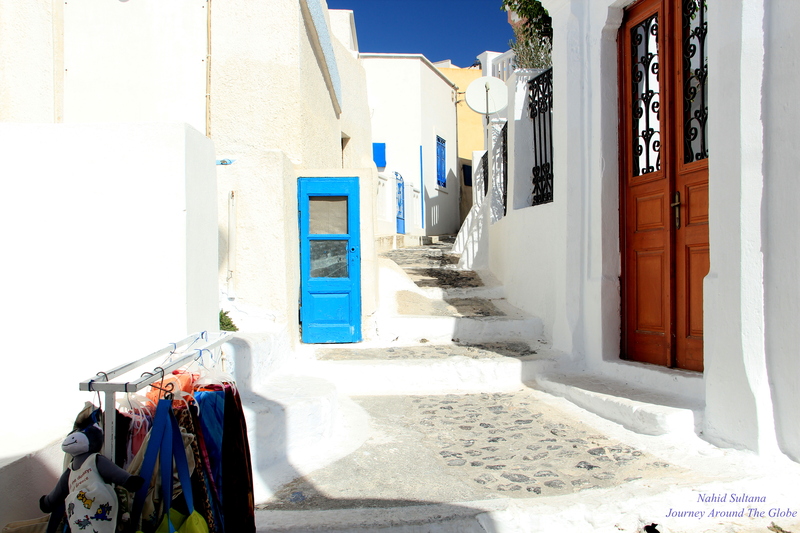 Cycladic houses, prominent Byzantine churches (all were closed), and homes with blue doors and cute porches made my journey here really unforgettable. I directly went towards the castle after getting off the bus. I hiked quite a bit here, climbed many stairs, and passed many small windy alleys to get to the castle (just follow the hand-written signs on floors and on walls). But once you are up on the castle, you’ll have an outstanding panoramic view of the whole island, mountains, and the deep blue water. The castle in itself has nothing really to offer other than its old bones and skeletons. Also there is no entrance fee or any information board for tourists. It took me about 15 minutes to come to Pyrgos from Fira by bus. Pyrgos is relatively bigger than Megalochori and I spent about hour and half here. 6) FIRESTEFANI: Firestefani is another cliff-perched village where you can get the best panoramic view of the volcano. It’s smaller than Oia or Fira but definitely has the same view and charm. Many luxurious hotels and resorts are on the cliffs of Firestefani. 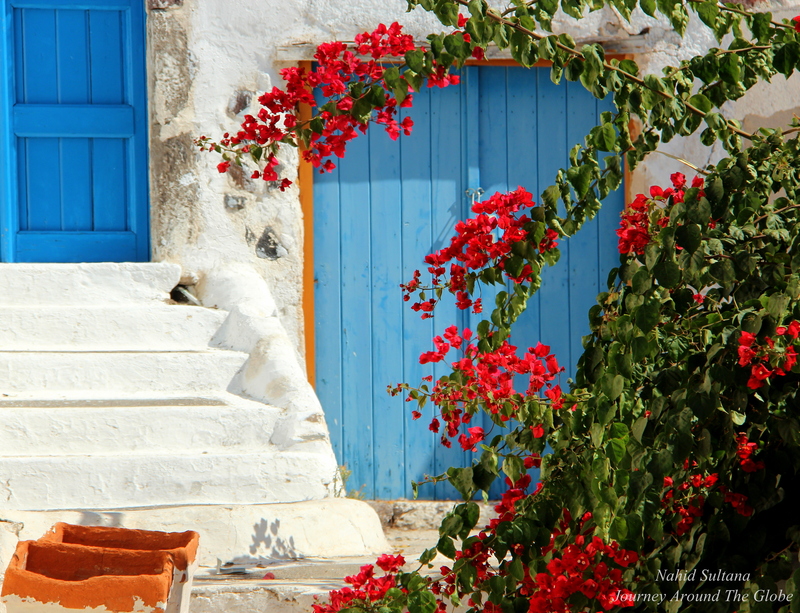 Apart from those, the village maintained its traditional looks where you can see dominating blue and white colors everywhere and few Cyclades churches. I didn’t go down the stairs here, just spent about an hour walking parallel to the Aegean. Then last few minutes I was just sitting on a bench on the cliff enjoying that great moment right before the sun set down, but didn’t really see the sunset. This was another place from where I wanted to experience a sunset but didn’t. You can avoid the sunset crowd of Oia and come to Firestefani for a serene atmosphere when the sun vanishes in the horizon. 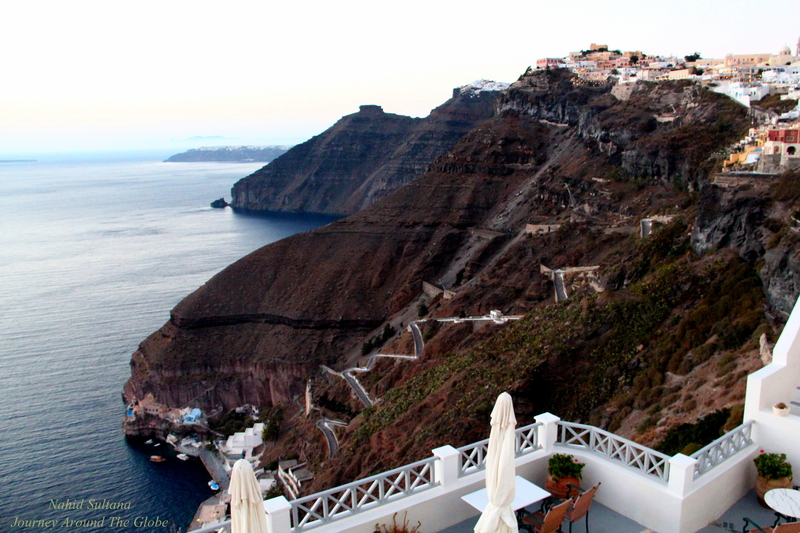 7) IMEROVIGLI: Not too far from Firestefani, Imerovigli is another smaller resort village hanging from the cliff. 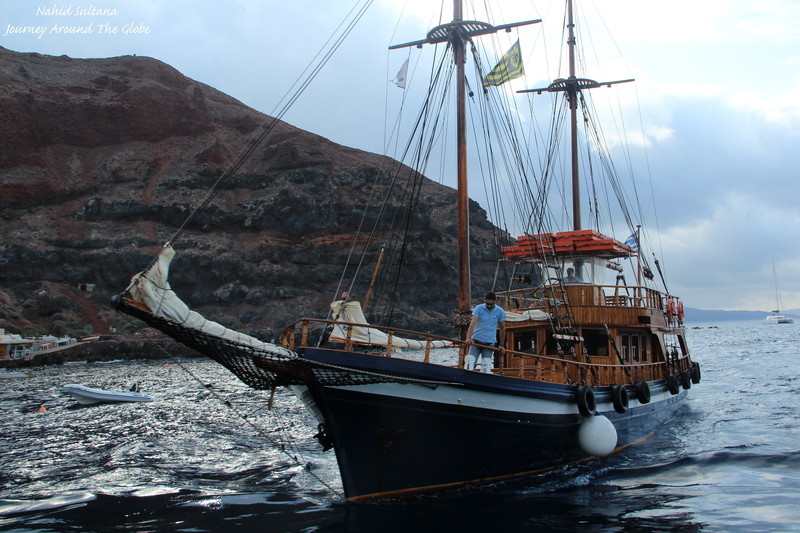 It’s a short bus ride from either Fira or Oia and offers rewarding views of the caldera and volcanos. I reached here late afternoon and loved its calm and peaceful life. I went down few steps on the cliff and decided to come back to a café for some ice-cream. As usual, view was marvelous. My original plan was to stay here until sunset but I really couldn’t find a nice spot to sit down or even just stand (like Firestefani had). So after spending about an hour here, I took the next bus to Oia and enjoyed the most famous Santorini sunset from Oia cliffs. 8) AMMOUDI BAY: My original plan was to go down to Ammoudi Bay in early morning to see fisherman getting ready to start their days and go out to the sea. But of course I couldn’t do it and went there a bit later around 9:30am on the day I took boat trip to see other islands. 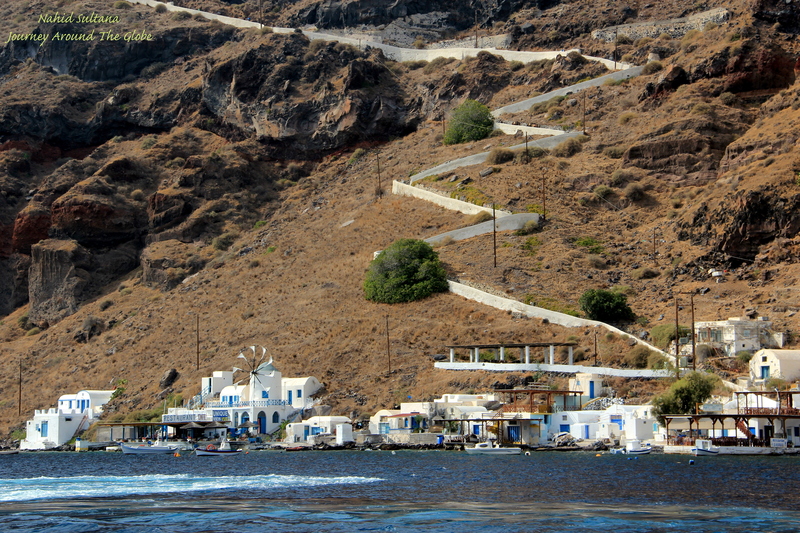 Ammoudi Bay is a petit fishing village at the foothill of Oia where you can find some best fish taverns near the bay. It doesn’t have a beach but has a nice swimming area for public. 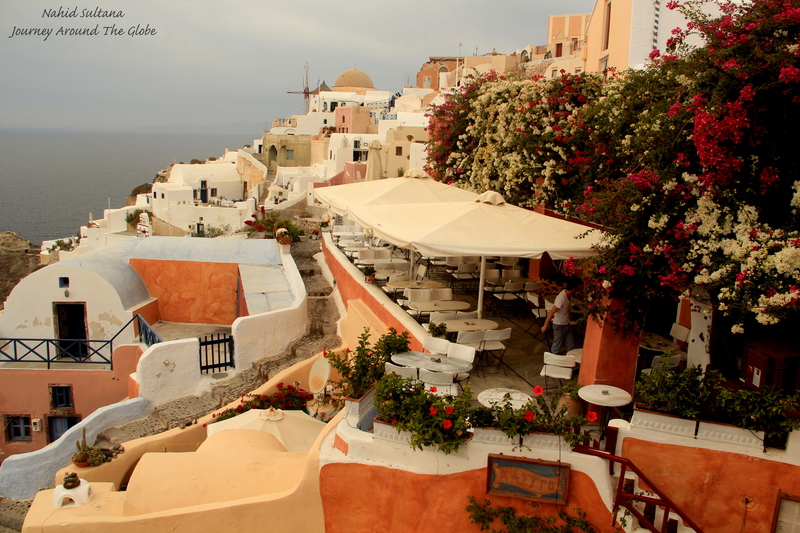 It’s a small but a must visit place in Santorini to get a different feeling of this island. 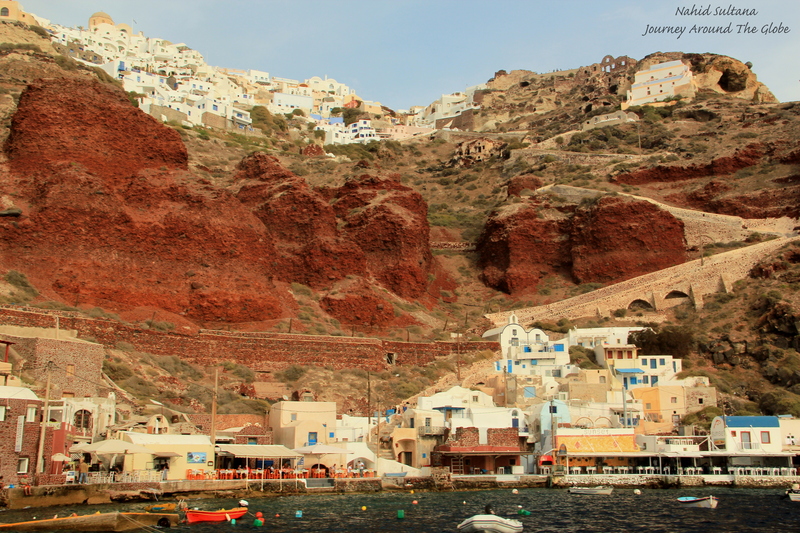 Look up the red cliffs of Ammoudi Bay and you can see the whole village of Oia in one glimpse. If you are taking a boat trip, don’t forget to look back at Ammoudi Bay and Oia…it’s a fabulous view and shouldn’t be missed. The pebble beach here is nice for swimming and sun-bathing. There are 3 ways to go down to Ammoudi Bay. The easiest way is to take taxi from Oia which costs about 10 euros. 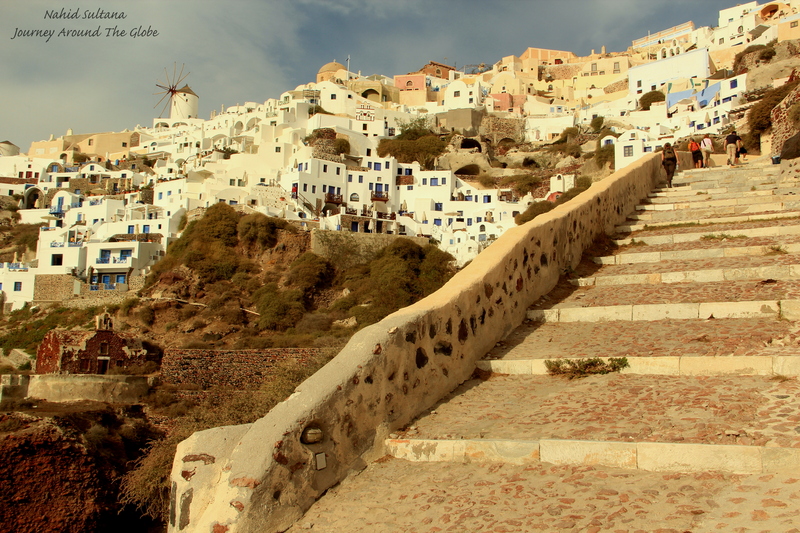 Second option is to take some 250 steps which starts at one end of the pedestrian zone of Oia and ends at the foothill of the cliff close to the bay. The final and adventurous option would be taking a donkey ride either way only for 5 euros per adult. Be careful when walking down the steps to go to the bay, there are lots of donkey poops all around the stairs. It can get even worse and slippery if it rains. Make sure to have good shoes if you are planning to climb the stairs. I actually climbed 250 steps from Ammoudi Bay up to Oia center. It can be hard but this is the best way to enjoy the view all around and take some great shots. To be honest, I had to stop and catch breathes every few minutes. 9) BOAT EXCURSION to NEA KAMENI, PALIA KAMENI, and THIRASSIA: A shuttle bus picked all the passengers for this boat excursion from our individual hotels and took us to Ammoudi Bay around 9:30 am where we started our tour from. From here we went to Fira, picked up more people, and headed towards our first stop Nea Kameni. This boat trip is a must-see when in Santorini, you get to walk on lava rocks and experience an active volcano land from up close. The tantalizing dark islands in the middle of caldera are Palea Kameni (Old Burnt Island) and Nea Kameni (New Brunt Island). Both are major scientific interests and protected national monuments of Greece. The sites offer an exceptional natural beauty in and all around the island. 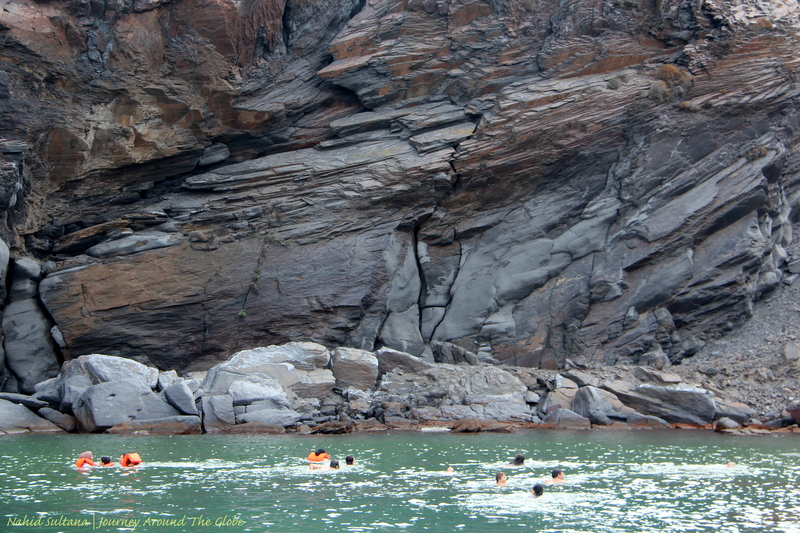 Its oldest rock formations date back 430 years and its most recent a mere 50 years. The islet was born and gradually formed through volcanic eruptions spanning since 1575, in six different volcanic events. Sluggish magma at regular intervals added layer upon layer to form Nea and Palia Kameni. Both islands are the youngest landforms in the eastern Mediterranean. Authorities do keep their eyes open for seismic activity and other matters in these areas where they can predict in a period of a few months to a year prior to the eruption. While no one actually lives in Nea Kameni, Palia Kameni has only 1 residence, and Thirassia has about 200 inhabitants. 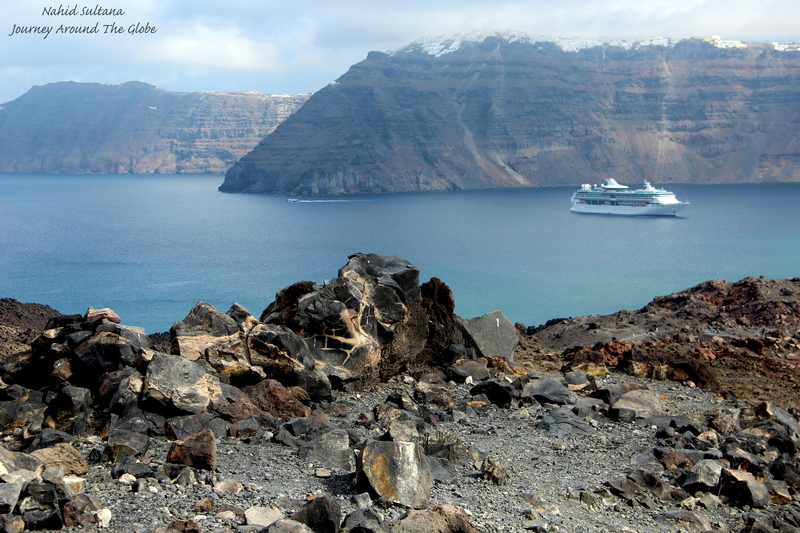 After the last eruption of Nea Kameni in 1950, the Santorini volcano remains dormant till today. We hiked about 1.5 km one way (total little more than 3km) to get all the way up to go near the big craters where you can still see hot fumes at some points and smell sulfuric gas with it. 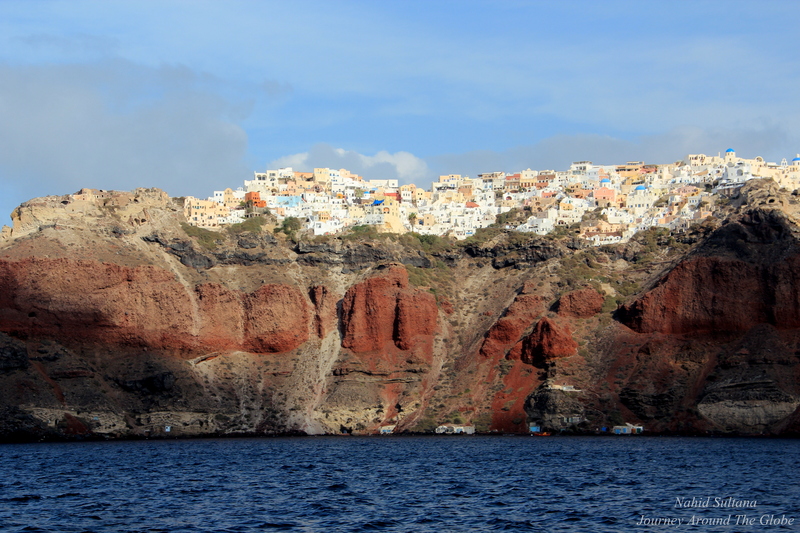 While hiking on this rugged with various colored rock terrain, look around and you will see Fira on the roof of caldera in distance. It can get a little windy at the top but the view from there worth the long hike and heavy sweat. There is a 2 euros fee to enter the preserved landscape. Next we headed towards the hot springs of Palia Kameni. This is smaller than Nea Kameni and looked much greener. First eruption on Palia Kameni was in 197 B.C and the last one was in 725 A.D. but right now this is an inactive volcanic island. The boats really don’t dock here, it stood in the water close to land while people just dived in the sea, swam for half an hour in the hot springs underneath the sea, and got back on the vessel. We spent about half an hour here. Remember that the sulfur rich water here may not be suitable for many people. If you are like me, who doesn’t know how to swim L, enjoy the massive rock walls of the island, greenish water, and Church of St. Nicolas on the edge of water. Thirassia was our last stop on the boat tour before heading back to Oia. This is a small island and a nice place to spend couple hours. There are few ferries that come here from other islands if you don’t want to take any guided tour. We had about 2 hours to spend here out of which I spent an hour enjoying my lunch and the view. Rest of the time I just walked by the water taking photos and enjoying every corner of it. But I didn’t go to the main village up on the cliff. There are couple villages on the cliff top which can be reached by climbing 270 steps or taking a donkey ride for 5 euros. Those villages are supposed to be some typical Grecian villages that kept its old look and feel. The port of Thirassia is a great choice for walking, swimming, and eating. There are plenty restaurant here as well. Our guide recommended Captain John, but many of us on the group had lunch in the restaurant right beside it thinking it was Captain John, but good food either way. Enjoy the cliffs, view, and sound of the sea while here. Overall, Santorini was a great experience for me. I do get excited when going to a new place where I can learn some history (not only by visiting churches and castles), enjoy natural beauty, do nice shopping, taste local cuisines, and where I don’t have to walk with a map or with an itinerary. Santorini was that perfect place for me that fully satisfied all my wishes. Love you Santorini, hope we see each other again.